i'm tugging a tag-a-long also and love it! I'm planning on going this route. Awaiting a hitch; and when that's done I'll probably pick it up. Just drill 2 holes down thru the tongue and bolt on a piece of angle stock. I only had one piece of angle on hand so I just strap the cooler to that. Works fine. I was going to post pics, but I haven't figured out how to get my new fone to take non jumbo pics. I went to Wallmart and bought a camping grill..passed a couple of bolth through and mounted it to the tongue. Works well, and was very inexpensive. If I need a Grill (because the one's at some campgrounds can be sketchy) I can remove my Cooler rack and grill up some chow. I liked my Tagalong very much...upgraded to a Roll a Home for some more creature comforts... but the Tag along has served me very well. I actually mounted a solar panel to charge a deep cycle battery, as I need electricty to run my CPAP... having the extra capacity to run lights and a fan is a bonus.
" I actually mounted a solar panel to charge a deep cycle battery, as I need electricty to run my CPAP... having the extra capacity to run lights and a fan is a bonus." How did you run a solar panel? Do you have any pictures of how you mounted it? I don't have any pics right now... but I can describe. On the "high" side of the trailer roof, I mounted a 1/2 in marine grade plywood platform. To this I attached a 30w solar panel that was mounted to a stainless backing...didn't want a glass one as that could break too easily. I drilled a small hole in the rear of the taggy, and passed the wire in to the box. I routed the wire in a conduit to just above the axle where I mounted a battery box (velcro to the floor) with a deep cycle battery. On the battery box was the solar controller and quick disconnects...so I can take the whole battery out and have a tag along...albeitt with a solar panel mounted. Not too expsensive... got a great deal on the panel.. 90.00 ...usually is close to 300... and 100 or so for the battery... I had a controller from another project, but they are not expensive. On top of the battery box, I also had a 1000 w inverter and a 12v dc power port. Could run just about anything. Simple...just mount everything to the battery box.. .and it is removable. Never ran out of power when camping... during the day, I would move the Taggy in to the sun in the parking lot, top off the battery.. then back to the campssite to run the CPAP and lights.. and FAN... and the coffe grinder... matteess air pump, you name it. Was fairly conservative in using the electric because of the priority for the CPAP.. but never ran out or had the batery drop REAL low. Oddly enough, I am modifying this design to work with my newly purchased Roll a Home... don't have the solar connections, but am running a 30A power inlet to the box to runn the A/c and re-charge the batteries... and make fruity blender drinks! 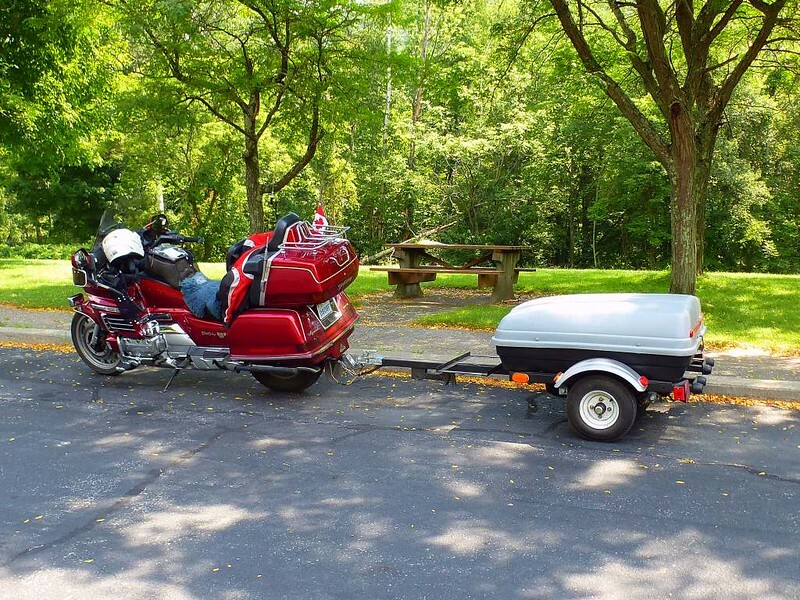 I also pull an HF Tag-along trailer. Like others, I extended the tongue and repacked the bearings with Mobil1. There are numerous companies that make them in the 16 - 20 cu/ft size. Sears being one of them. Keep an eye out in your local Craig's List/yard sale for a good one cheap. I had one that's 16 cu/ft given to me to make mine. I cut the frame to size and installed the cargo carrier and it works well. If starting from scratch (no trailer frame kit/cargo carrier) then the Tag-Along from HF is the cheapest/easiest way to get into trailering. I just bought a HF tag along, in fact I just got home with it yesterday and it is still in the box. I will be pulling it behind my 85 Aspencade. The question I have is how much do you add to the tongue to extend it? I did buy the LED light kit, and will repack the bearings. I am open to any other tips.